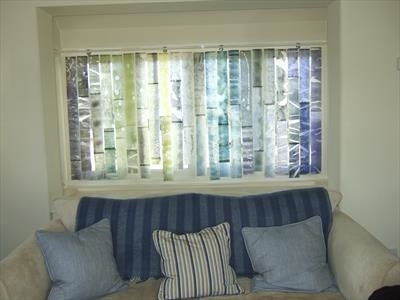 A commission to screen a window, made from hand-printed strips of Japanese paper, suspended from an acrylic rod. Others similar or different can be commissioned. This customer required a piece of work to obscure a dull outlook from their living room window, yet stipulated that they should retain the possibility of seeing when visitors approach the house. The work allows the householder to see between the strips of paper, whilst offering an interesting new dressing for the window. Made from a strong yet delicate Japanese paper, the paper was hand printed to evoke an underwater atmosphere, moving gently in the breeze. The work is suspended from a transparent acrylic rod. Others can be commissioned from the artist.